U.S. carriers are expecting a million more passengers compared to last year. More than 30.6 million people across the country are expected to fly during the Thanksgiving holiday this year and it could set a record. The current record was set when an estimated 29 million passengers flew during the 2017 travel period, which this year spans from Friday, Nov. 16 through Tuesday, Nov. 27. Transportation and security officials have said they are prepared for the rush, but travelers should expect increased crowds throughout the 12-day period. The Sunday after Thanksgiving is projected to be the busiest when an estimated 3.06 million passengers will take to the skies, according to Airlines for America, a trade organization for some of the largest U.S. carriers. 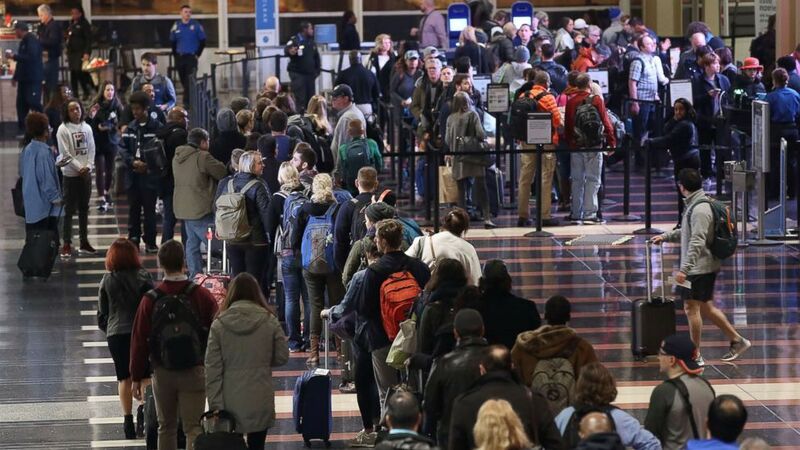 The Wednesday before Thanksgiving could be the second busiest with about 2.93 million travelers. The lightest travel day is expected to be Thanksgiving day with an estimated 1.73 million passengers. To accommodate, U.S. airlines will be adding 158,000 seats per day for an additional 137,000 daily passengers by adding more flights and using bigger aircraft, with a total of 2.94 million seats available each day. The traveling forecast predicts 2.55 million people per day during the two weeks. (Mark Wilson/Getty Images, FILE) Travelers wait in line to go through the security area at Reagan National Airport on Nov. 21, 2017 in Arlington, Va. The Transportation Security Administration said it is ready to handle the crowds. A shift toward automation and biometric technology by the agency will help get passengers on their planes faster and safer, TSA Administrator David Pekoske told reporters at a briefing. An additional 80 canine teams and more than 1,200 TSA officers will be manning the checkpoints over the holiday travel period.